Sugared Ink: Contest: Win Bridesmaid Dresses from Moonlight! Contest: Win Bridesmaid Dresses from Moonlight! As seen on Wedding Bee, there is a super fun new contest sponsored by Moonlight Bridal for brides-to-be & their maids. 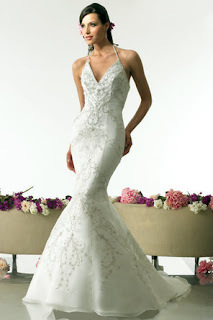 Moonlight is known for creating some of the most heavenly bridal wear out there! The Moonlight Who Wore It Best Contest — where you have the opportunity to win up to 5 bridesmaid dresses from Moonlight’s 2009 Me Too or Val Stefani collections — valued up to $800! 1. Visit a store which carries Moonlight bridal wear, and put together a look from any of their bridal or bridesmaid collection. Find the dress that best flatters your figure and don't forget to accessorize! 2. Upload the photo of your completed look to the Gallery here, and link to it on the Wedding Bee thread here. The winner will be chosen based upon the overall style and fit of the dress by the Sponsors. You have until February 8, 2010 at 12:00 PM PST to enter ~good luck! See all the official mumbo jumbo here.